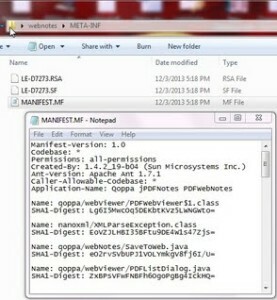 What are the new manifest entries required for applets? Java 1.7 has recently added new security requirements when running applets. Java now requires additional entries in the manifest files of the jars that the applet use. If these entries are not present, Java will show warning dialogs raising security concerns. Starting with Java 1.7 update 51, some of these entries are now required and the applet will not run at all of they are missing. Warning: This application will be blocked in a future Java security update because the JAR file manifest does not contain the Permissions attribute. Please contact the Publisher for more information. All jar files that the applet uses need to have these attributes in their manifest, otherwise Java will show security warnings as each jar file is loaded. How to add these manifest entries to the jar file? Looking into the META-INF folder of our jar webnotes.jar. Open the Manifest file (MANIFEST.MF) and notice all the attributes present in the manifest. For more information, read How to add the new manifest entries to your jar through command-line or through an ant build.